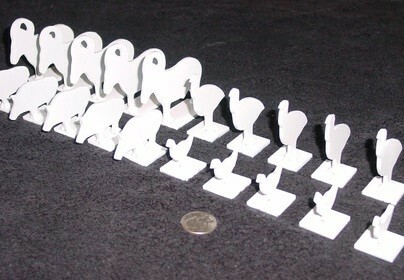 Set includes Six 24in. tall knock-over & Hanging stands with 2in.x4in. 3/8in. AR500 base for mounting. Great for pistol and rifle shooting. Manufactured from new high quality 3/8in. thick A36 steel and 3/8in. thick AR500 steel made in the USA. The hook is sized to fit all of our hanging products 4″ and up. Knock-over stands are precision cut with a CNC plasma cutter and submersion water cooled during the cutting process to maintain the integrity of the steel, ensuring the longest life of the stand. A stands are professionally welded using strong heavy duty welds extending the full length of the base area. Email us at magnumtarget@gmail.com or call us at 501-503-1525 with questions or custom quantities and sizes. Emails will be responded to within 24 hours with the exception of weekends and holidays. Knock-over stands are not designed to be shot at. Buyer assumes all responsibility for the use and misuse of the purchased targets and accessories. Gong hangers work exceptionally well. Easy set-up. Easy tear-down. Should have bought these from the get go.